Right after graduating from architecture school at Kansas State University in 1996 I moved to back to Chicago, getting a job in the firm DeStefano + Partners a few months later. Working for a firm whose partners were formerly employed by SOM, and working alongside many intern architects who had attended the Illinois Institute of Technology, I quickly learned the differences between my education and others. Whereas K-State was strong on conceptual design (basing studio projects on concepts rather than just function), history, drawing, and environment and behavior, the lineage of architects who trained at IIT following Mies van der Rohe excelled in technical considerations. "What material is your building made of?" was a little-heard question during jury reviews at K-State, but projects at IIT started with materials, mainly steel and concrete. In a sense these two ways of design are at either ends of a spectrum: form divorced from material and material determining form. Given that since 2000 Georg Windeck has been teaching at Cooper Union – the school of John Hejduk, Elizabeth Diller and Ricardo Scofidio, and Daniel Libeskind – I'd figure he must fall into the "conceptual" camp. But that label would be premature, as is evidenced by his studies at Technical University Berlin and Construction Matters, which studies the use of four materials (masonry, concrete, steel and wood) in eleven projects. It would be a stretch to say these materials exclusively dictate a building's final form – in effect removing the architect from the equation – Windeck goes as far to say in the introduction, "One particular building method often establishes the main principles according to which an architectural design is generated, determining its fundamental tectonic gesture." The projects that follow serve to elucidate this statement while "positioning architecture as a dialogue between artistic concepts and engineering methods." Neither purely historical nor purely technical, Construction Matters functions like eleven small case studies for modern and contemporary buildings, explaining their concepts and methods through words, photographs, and drawings. Much of the book's values lies in the photographs, but not the glossy images we've come to expect upon a building's completion. No, this book is loaded with construction photographs, detailed photos of assemblies that have long been covered up, and detailed photos of generic techniques (welding joints, for instance). 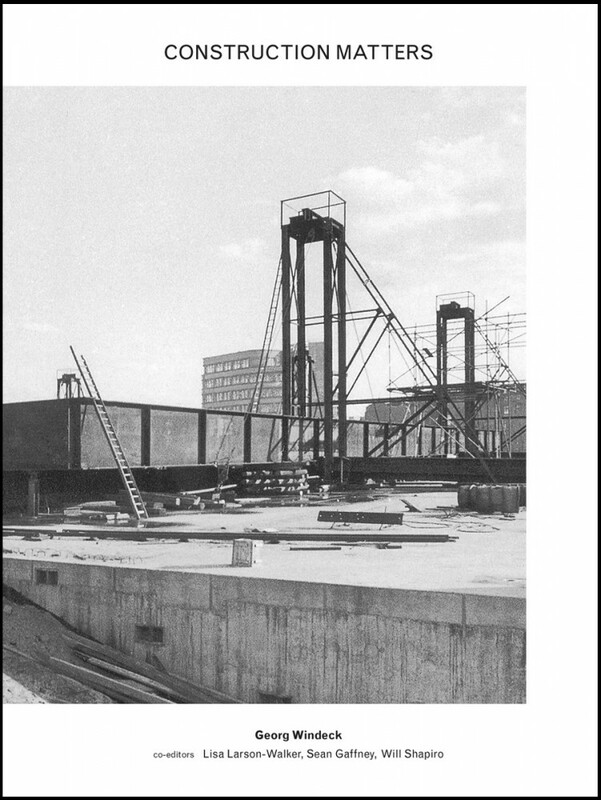 These types of photos are packed predominantly into the chapters on concrete and steel, which deal specifically with thin-shell concrete and steel framing. Not surprisingly, Mies is a strong presence in the steel chapter (Farnsworth House and the New National Gallery), but so is Toyo Ito, whose Sendai Mediatheque took the material in an exciting direction 15 years ago. A few years later he did the same for concrete, with the undulating roofscape of the Meiso no Mori Municipal Funeral Hall (Mutsuro Sasaki engineered both buildings). With their thorough explanations in words and images, these two Toyo Ito buildings are worth the cover price alone.